THE MARTINI CHRONICLES: Clever Solutions to Common Diva Mishaps! 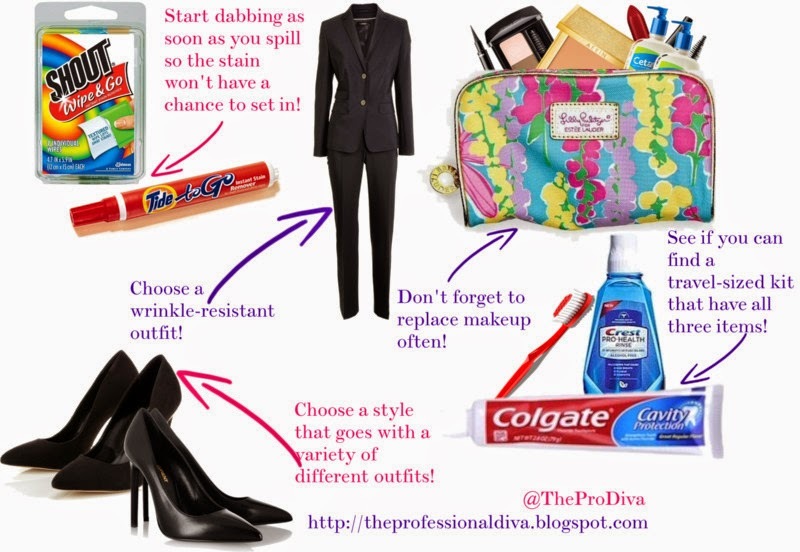 Clever Solutions to Common Diva Mishaps! Quick story...last week when I was heading into the office, I took a look in my rear-view mirror, and guess what I noticed...I noticed that I had only put eyeliner on one eye! Seriously I did! I'm pretty sure of what happened. I was rushing to get out of the house in time before traffic picked up, and I got distracted. So here I am sitting in the parking lot of my office with one beautifully-decorated eye, and one naked eye...I wasn't worried. Why, you ask? Well, this sought of thing seems to happen to me all the time. And over the years, I have learned to prepare for my raggediness by keeping a stash of necessities in my office. Since I was recently reminded of my occasional mishaps during my eyeliner debacle, I thought I would take a moment a share some of the solutions I have concocted over the years. Now, I'm not necessarily saying that any of these mishaps have actually happened to me...all I'm saying is that it's best to be prepared. Enjoy! Mishap #1: You walked out of the house with a black shoe...and a blue shoe! Solution: How many of you have done this? Personally, when I go shopping for work shoes, I often buy the same style pump in three different colors: black, blue, and brown. Sure, I have other varieties, but it is always good to have what I call "standard pumps." Since the pumps are all the same, and I am often putting on my shoes in the dark, I have on occasion made it all the way to the office with two different colored shoes on my feet. After my first embarrassing shoe blunder, I made it a point to keep a pair of black pumps in my office...just in case! Just be sure to bring them back to office the next day. Mishap #2: You put your makeup on in the dark...or while you were at the red light...or anywhere where it did not turn out right! Solution: I refer you to my eyeliner debacle discussed above. As I said, I wasn't too concerned because I had an emergency makeup case in my office. It's a small case with just a few of the basic makeup items: powdered foundation, a basic eye shadow palate, an eyeliner, a tube of mascara, a lip gloss/lipstick, a travel-sized face wash, and a travel-sized moisturizer. A small makeup case is perfect if you have a mishap (like me), if you need to freshen up after lunch or before dinner, or if you need a complete redo! Just remember that you need to take inventory of your makeup every few months. To help you remember, change your office stash of makeup at the same time you change your main stash. Mishap #3: You accidentally bit into the onion and garlic bagel you scored from the office supply, and you really don't care if you eat the entire thing...you're hungry! Solution: This one is easy...keep a toothbrush, toothpaste, and travel-sized mouthwash in your office. Brush and gargle after lunch, and after any funky snack sessions. Remember to replace your toothbrush as necessary. Mishap #4: You bent down to pick up your cell phone that you dropped on the floor while scurrying to a meeting, and...well...you split your pants! Solution: This is a solution that I learned early in my career. You should always have a spare outfit in your office...just in case you split your pants...or spill Coke Zero all over your dress. In any event, having a spare is never a bad thing. You should choose something that works well across the different seasons. And make sure you take inventory of your spare attire every six months to ensure that it still fits...especially after the holidays! Mishap #5: In your haste to finish your cup of coffee before heading to your office-sponsored training on file management, you spilled a few drops on your blouse...your brand new blouse! Solution: Keep a stash of stain removers in your office for occasions just like this. A Tide stick or a Shout wipe are good choices. Dab that blouse on your way to the training! Any other tips that you would like to share with the group? We're listening! Have a great work week Divas! It is sought of like that isn't it! I'm starting to realize that if we prepare for ourselves the way we prepare for children, we would almost never be caught out there! Thanks for continuing to support the blog. I've been off the grid for a while, but I'm back! Spread the word! A mini can of hairspray is always a good idea too. Depending on humidity and the fickleness of the building's air conditioner--I can at least keep my hair looking good. That's an excellent idea! Maybe a hair-mishap stash in the office is an important addition to this list...including hair spray! Thanks for sharing!